Today, U.S. politics (and those of close allies) are much like the Upside-Down of Stranger Things: an inversion of how things should be, and a shadowy ghost world where logic goes to be torn apart by terrifying monsters. Want proof? 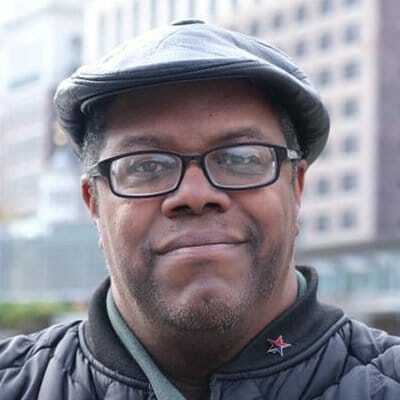 How often have you heard someone claim that the “real fascists” are anti-fascists? 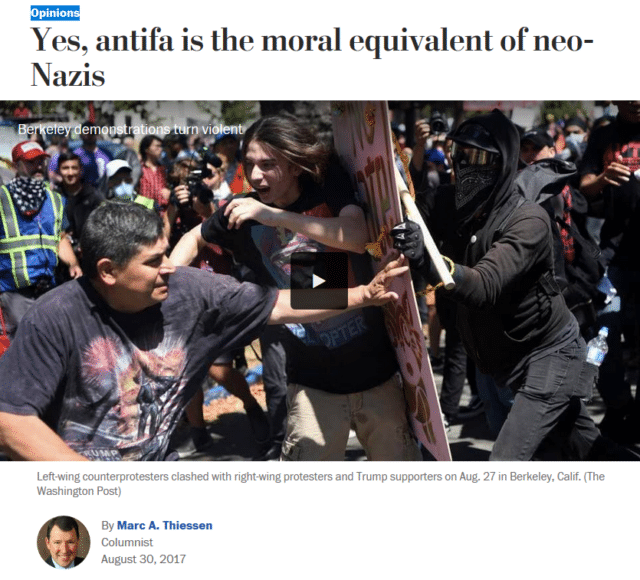 Even after the fascist riot and murder at Charlottesville, Frontpage (8/10/18), the Daily Caller (8/20/18) and Daily Mail (3/26/18) argued just that. Many conservatives say blame [for violence in Charlottesville] should be shared by Antifa…. 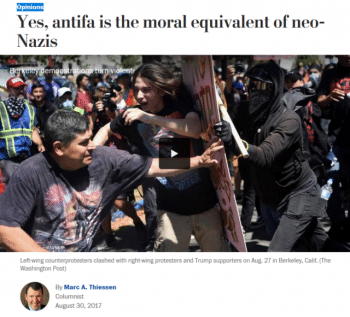 Antifa does not shy away from militant protest methods, including the destruction of property and sometimes physical violence…. 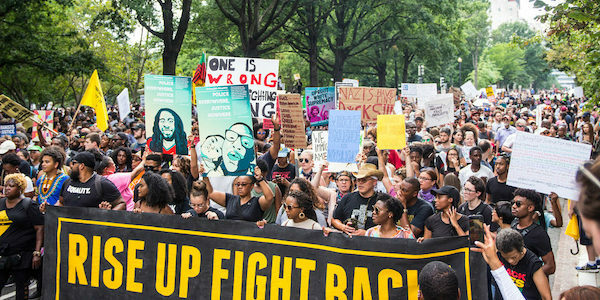 Much like the far-right, chapters of Antifa are loosely connected and highly secretive. The biggest thing they get wrong is making it as if it is just between the two sides. Fascism impacts society at large. It doesn’t just hurt activists opposed to them. But because they write otherwise, people generally think that what is going on doesn’t directly impact [them], and they are not harmed. Everyone had an opinion on that, but that same energy was not apparent as neo-Nazis made an annual event over the past 11 years out of something they called the “Leif Erikson Day Celebration” at that statue. Even as they reported on the statue, they mentioned it in passing, and only as a possible reason for it being in the river…. This kind of obtuse reporting—if they report at all—goes on a lot, and it serves no one and nothing except to protect the Nazis. During the Republican National Convention in Cleveland last July, the city’s central plaza became an ideological Star Wars canteen. Burly Christian fundamentalists hoisted signs denouncing Islam a few feet from a publicity-seeking Muslim with an AR-15 slung across his back. Clusters of communists chanted “America was never great!” while Bikers for Trump paraded around in MAGA hats. For many liberals—a category in which I include myself—Antifa’s willingness to use violence and eagerness to shut down right-wing speech seem both morally wrong and strategically obtuse. And it’s not just any speech that Antifa activists oppose: It’s the call for racist violence and murder. There’s a basic pattern to genocides, beginning with speech dehumanizing the eventual victims by comparing them to vermin, claiming they’re sexually deviant, and accusing them of moral, cultural and often intellectual inferiority. Such claims can justify, for instance, widespread imprisonment, and weekly or daily state execution of their population in the streets, or the kidnapping of thousands of their children, or their mass expulsion. But despite a litany of lies from various prominent personalities about a threat to free speech, the white supremacist voice is growing only louder. 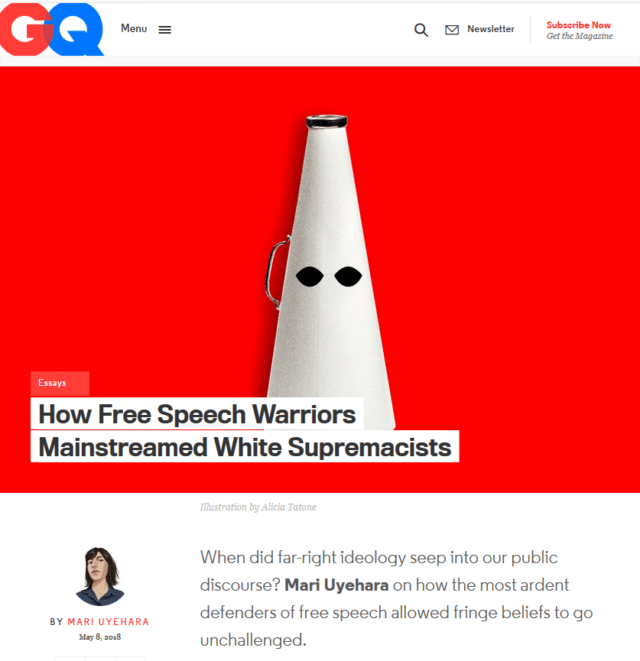 In her GQ article, “How Free Speech Warriors Mainstreamed White Supremacists” (5/8/18), Mari Uyehara cites the Anti-Defamation League finding a 258 percent increase in white supremacist propaganda at U.S. colleges between autumn 2016 and autumn 2017, and demonstrates the clear hypocrisy of right-wing so-called “Free Speech Warriors,” who are thunderously silent on attempts to criminalize the speech of the Boycott, Divestment and Sanctions (BDS) movement against the Israeli occupation of Palestine (New Arab, 8/3/17). In Scotland, Mark “Count Dankula” Meechan was arrested and fined £800 for a YouTube video in which he taught a pug to mimic a Nazi salute to phrases such as “gas the Jews.” His punishment drew outcry from right-wing personalities Alex Jones, Paul Joseph Watson and Lauren Southern, and “classical liberals” like Dave Rubin, host of the YouTube show the Rubin Report. Of course, in Canada, 2017 began with a very real threat to free speech, thought and life: A white supremacist/Christianist terrorist shot and killed six (Muslim) Canadians in Quebec City. CBC ran the Lee audio essay mere weeks after a white supremacist at Charlottesville murdered anti-racist counter-protester Heather Heyer with his car. 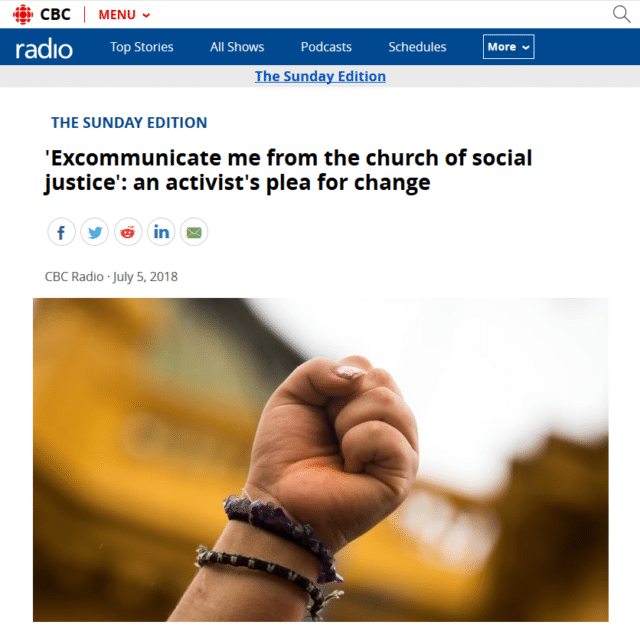 As the Washington Post (8/17/17) reported, but the CBC did not mention during its pearl-clutching fantasy about “QTPOC supremacy,” many Republican legislators have been pushing to legalize the weaponization of cars to kill protesters. It’s gonna end with the expulsion of the majority of the migrants, including [Muslim] citizens…. It’s gonna end with concentration camps and expulsions and war at the cost of a few hundred million people. 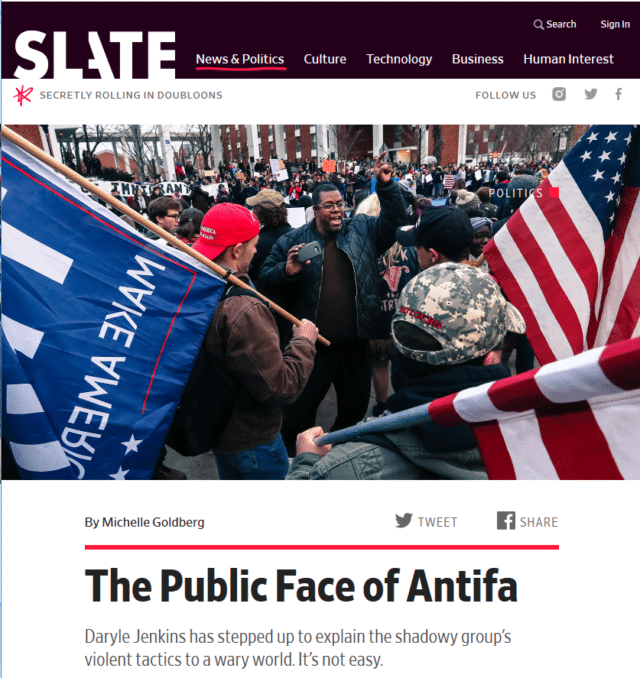 The threat of doxxing by antifa has proven so effective at driving the alt-right underground that even neo-Nazi blowhard Spencer has whined that “Antifa is winning,” a sentiment he expressed back in March, but that seems to hold even more water in the wake of Unite the Right 2. 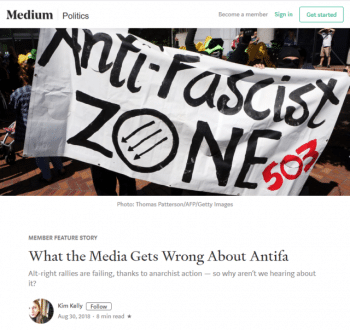 Liberal handwringing over the idea that antifa and the black bloc were being rude to and “attacking” journalists…. It is interesting seeing the way that Democrats and progressives react to the specter of militancy. While armed racists, Islamophobes and antisemites are not invincible, they remain extremely dangerous, as Gregory Bush demonstrated by killing Maurice Stallard and Vickie Lee Jones in Kentucky on October 24, and Robert Bowers showed by massacring 11 people at a Pittsburgh synagogue on October 27. Christian Identity is a religious ideology rooted in the idea that Jews are actually the offspring of Satan…. 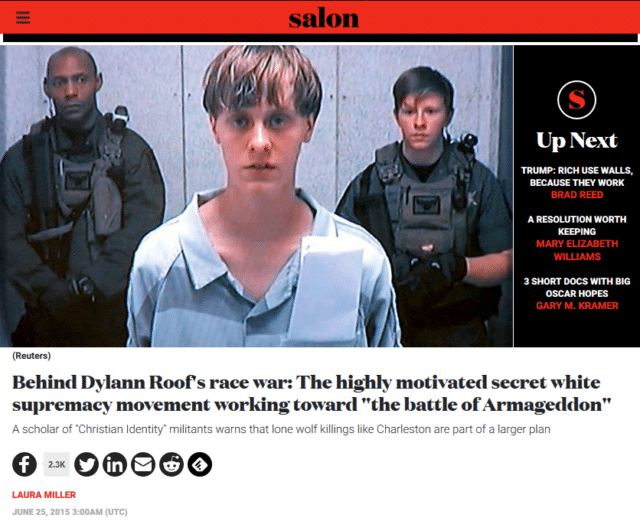 Minority groups, especially African-Americans, are seen as subhuman, “mud people.”… The idea is that Jews have engaged in this deceptive, cosmic conspiracy to manipulate minorities against whites. And at the end of times, we’re going to get a race war…. Then white Europeans will live in a paradise. As Wexler notes, the recruiters for these movements don’t usually announce racial extermination as their real goal, so they use anti-tax, anti-government and anti-immigrant grievances as the gateway ideologies to neo-Nazism. Right-wingers have people scared to address their racism. They perfected the art of denial, and throw temper tantrums that intimidate mainstreamers. What Trump did was to give the biggest hatemongers an even wider field to play in, and who do they hate the most? Antifa, because we don’t play that game. We call them out for who they are, and work to do something about them. Anyone who does that to a conservative is a threat, and they try to make them look like they are the most evil people on the planet. Much like saying the Klan and Nazis were actually leftists. It’s something not rooted in education, obviously, but we have seen that stunt before. Ironically, the Nazi propaganda ministers would paint their enemies as the true aggressors, and not them. The lesson for counter-fascists is clear: Expect no medals, but rather corporate media condemnation, for attempting what countless soldiers in “the Greatest Generation” sacrificed their lives for: the defeat of fascism.